The best marketer with the best message wins. 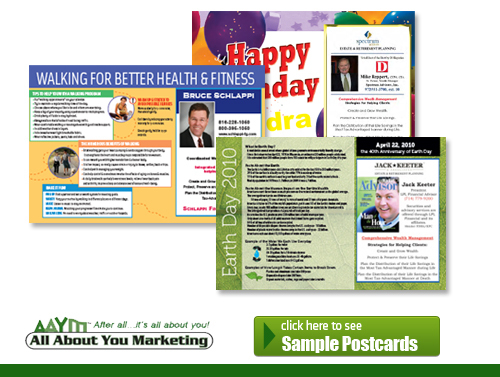 Connect with your ideal prospects on a monthly basis with these attention grabbing postcards. Each postcard is personalized with your information and packed with useful long lasting information. Get noticed by your ideal prospects and be THE Financial Advisor they turn to for all of their planning needs. Creative: Unique jumbo size 5.5” x 8.5” postcards that are designed to be held on to and referred back to for months, even years to come. Postcard messages are geared toward general useful information. Customization: Each card is personalized with a message from you, your color photo, contact information, logo and any other pertinent information you may want to include. Convenience: It’s all about you and it’s all done for you. After you give approval of your personalized message one time, the design, printing, addressing and mailing of your monthly marketing piece will require no administration on your part. Consistent: Consistent leads come from consistent marketing, and the best marketer wins. Automatically stay connected to your prospects and current clients. Generate leads and additional referrals by using this monthly program. Competitive: Stay one step ahead of your competition with exclusive zip codes. Sample postcard topics include sport schedules, travel information, useful tips for a healthy lifestyle and many other valuable and exciting topics.